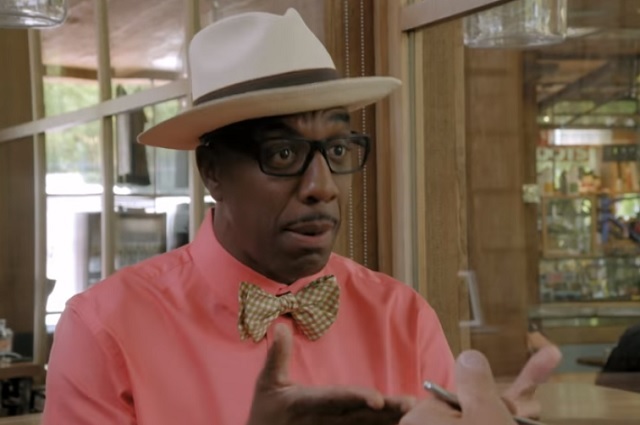 After last week’s disappointment with Judd Apatow, J.B. Smoove was tasked with righting the Comedians in Cars Getting Coffee ship. He wasn’t too energetic for the slow-paced show and made some great jokes. Team that with a solid car and Smoove’s amazing wardrobe, and Comedians in Cars is back on track! There are few cars with as much style as “America’s Only 4-Passenger High-Performance Personal Car.” The red Studebaker Avanti proved to be a shiny opener to the episode. Smart move by host Jerry Seinfeld to introduce it by also giving a quick summary of the company and how the car came to be. He also makes it clear why no one younger than 40 — except Home Improvement fans — has even heard of this company. This was more than just Seinfeld’s typical car descriptions and made me care more about the vehicle than usual. Turns out, the Studebaker Avanti is also J.B. Smoove’s favorite car. It makes sense, considering Smoove is on the short list of people/things more stylish than this car. Granted, Smoove’s personality scared me. The last time I saw him on TV, he was dancing around in the Richard Dawson seat on Match Game. He is a funny guy, but he’s the Russell Westbrook of comedians. He always goes at 120 percent, which can end with him blazing to the hoop for a layup, but can also end up with him dribbling the ball out of bounds. Turns out, unlike Westbrook (shade thrown), Smoove has a dimmer switch! He toned it down to an appropriate level, complete with normal conversations and no dancing whatsoever. When Smoove saw the car, I thought he would fall over and cry. He was so happy to ride in the Avanti. Smoove had some funny jokes about the art of comedy. Then Smoove admitted, “I love putting myself in the third person.” This is Smoove on simmer. It’s still J.B., just without all of the highs and lows. Smoove goes on to talk about his post-bombing ritual, in which he separates the pecans from the ice cream in Häagen-Dazs butter pecan ice cream. It sounds like Robert separating the goods and the plentys in Everybody Loves Raymond. Other people find it weird, but it is cathartic for him and that’s all that matters. Once the duo arrived at the café, Smoove said arguably the most bizarre thing ever uttered on an episode of Comedians in Cars Getting Coffee. He admitted that he washes his car with lingerie. Seinfeld could not tell if Smoove was serious and had to hold back laughter. I’ve watched that section a few times and still have no clue if Smoove is trying to be funny or if he treats lingerie like sponges. Another recurring issue reared its ugly head this week. Seinfeld overtook parts of the conversation, including his bit about a straw representing laziness, a sentiment I wholeheartedly disagree with. He also had some lines that came across as insensitive, including one about homosexuality in the 1950s. In the middle of the coffee portion, Smoove gets annoyed with Seinfeld because he doesn’t watch The Walking Dead. “You’re not the first person to be upset with me for not watching their show,” he says, not realizing network television has, in fact, meandered on since his show went off the air. Getting back to Smoove’s amazing style, his bowtie story is fantastic. It’s like there is a special society for people who wear them. Maybe I’ll have to start wearing a bowtie… I just have to learn how to tie one. Eventually, Seinfeld starts talking about bees, which is funny considering his biggest on-screen success between Seinfeld and Comedians in Cars was Bee Movie. I think Smoove’s comedic talent came from his days as a door-to-door fire extinguisher salesman, a story he told toward the end of the episode. His sales technique was funny, but being unable to put out a fire during one pitch was the funniest moment of the episode, to that point. And I use the qualifier of to that point because of what happens as Seinfeld and Smoove leave the café. An 85-year-old woman named Jeanie comes in to celebrate her birthday. (Side note: is there anyone younger than 50 named Jeanie? If you are, please comment.) She ends up telling the comedians a funnier joke than either of them told during the entire episode! For some reason, the pair looks at sheep after their meal. It didn’t last very long, and neither did the drive home. Smoove has a clever line about 1964 in relation to the car, but it leads to an abrupt ending between seeing the animals and talking about milking cows.